Join us for a wonderful day during one the lowest daytime tide of the year on the shores of Whidbey Island where geography, fauna and flora meet in dramatic form, providing a wild edible smorgasbord for the ages. Did you know that all seaweeds are edible in our region, but that certain ones are better and more nutritious than others? Did you know that each species of clam and shellfish leave distinct markers in the sand and gravel so that you can know what you’ll find before you dig them up? Join us for a great day of hands-on discovery. If taking the ferry from Mukilteo, please arrive early for the 9:30 AM sailing. In fact, we recommend walking onto the ferry since we will be picking participants up at 9:55 AM in Clinton with our 15 passenger van. We’ll begin at 10:30 sharp with an intensive overview of the seaweeds, shellfish and shore plants we’ll be experiencing today that will be designed to make learning easy and understandable. Workshop instructor Chris Chisholm gathering Bull Whip Kelp from the shore immediately after a storm. Pack and eat a quick lunch, because now will be the best time to walk onto the beach and dig shellfish. The tide will be starting to go out fast at this time, so we’ll also collect seaweeds which present themselves, and depending on weather, we will try to dry them for later use. The walk out to the harvesting site is over a mile round-trip, so prepare for all weather with proper beach/wetlands footwear, rain and sun protection. We’ll return to our picnic shelter surveying native shore plants, learning how to distinguish characteristics of edible trees, shrubs and herbs. We’ll hang our seaweeds to dry, then begin prepping clam chowder, nori rolls and other wild edible delicacies in preparation for dinner. Our weekend workshops are designed for adults, but youth are also welcome to registerwith an enrolled parent or guardian. Directions to meeting location and carpooling information will be provided upon registration. • Please get the excellent A Field Guide to Seaweeds of the Pacific Northwest pamplet by Dr. Bridgette Clarkston or if you want the full book, then Pacific Seaweeds – A Guide to Common Seaweeds of the West Coast updated and expanded edition by Louis D. Druehl & Bridgette E. Clarkston. For shellfish, just get the Washington Sport Fishing Rules guide: click and download, then print the shellfish pages, or pick a free copy at any sporting goods store including Fred Meyer, etc. 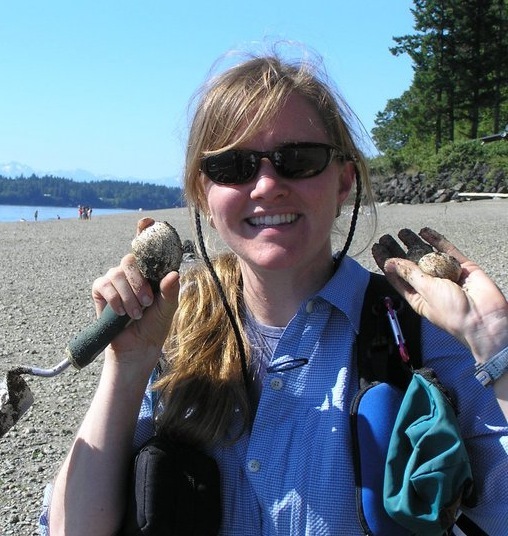 Finally, for the best identification to all the intertidal animals, order one of the precious remaining copies of the EZ Guide to Common Intertidal Invertebrates of the Salish Sea compiled by WSU Beach Watcher intertidal monitoring teams. • Before the workshop, check out our blog article on harvesting seaweed and shellfish and please read wdfw.wa.gov/fishing/shellfish/shellfish_seaweed_rules.html and get a license(and parking pass) as described above if you plan to gather shellfish and seaweeds. If you do, also bring a bucket and shovel, or better yet, a 4 prong “cultivator” rake. Also, some of the best online information about seaweeds is posted by Ryan Drum, Ph.D. who lives right here in the San Juan Islands so be sure to check out his articles. • Prepare to be outside in all weather, and bring rubber boots, lunch, water, plus a camp stove and cooking gear if possible, and the rest of your 10 Essentials. • Finally, please note that this is just a one day workshop, so if you would like to learn to a more advanced level and have time to really practice your skills, please enroll in our 5 Day Summer Course: Wild Ethnobotany & Herbalism Training with Wild Chef Charlie Borrowman. Contact us for carpooling information from Tacoma, Seattle, Everett, Mt. Vernon, Bellingham & Oak Harbor.